MS Dhoni was unable to get a favourable result for India in the 5th One Day International of the commonwealth Bank Series against Sri Lanka at Adelaide Oval on February 14, 2012. The Blue Shirts required nine runs in the last over but managed eight and the nerve breaking encounter ended as a tied. Sri Lanka scored reasonable 236 runs for the loss of nine wickets in 50 overs and India achieved the same score, equivalent wickets down in identical overs. MS Dhoni was declared ‘Player of the match’ for his brilliant Captaincy and unbeaten 58 runs in tense conditions when the match could have gone either way. Earlier, Mahela Jayawardene won the toss and preferred to bat but the decision bounced back as both the openers were gone at 28 runs in 7.1 overs. The experienced Kumar Sangakkara and sparkling Dinesh Chandimal got together and steadied the innings for the Islanders. They shared 51 runs partnership for the third wicket when Sangakkara spooned the fourth ball of the 20th over off Ravichandran Ashwin and was well caught by Gautam Gambhir at Point for 31 runs. It was time for the skipper to deliver with the bat and he supported well to Chandimal for nourishing the innings. The youngster added another fifty to his credit on the fourth ball of the 26th over as Jayawardene kept the score board moving with positive approach. The partnership looked solid and took the score to 173 when Vinay Kumar got the important wicket of Sri Lankan Captain for 43 runs. Chandimal tried to continue the attack but was unluckily ran himself out for 81 off 91 balls with one six and six fours. Sachithra Senanayake made some contribution in the lower order by scoring 22 off 14 balls with three fours as the Islanders got the total of 236 after losing nine wickets in the scheduled 50 overs. Vinay Kumar was the highest wicket taker with three, Ashwin got two and Irfan Pathan claimed one. India opened the innings with Gambhir and the little master Sachin Tendulkar who is desperate for his 100th hundred in the international cricket and that is slipping away from him. His hard luck continued with the bat in the match as he was caught by the wicket keeper Sangakkara off Nuwan Kulasekara for 15 runs. Gambhir continued with his great form in the ODI series as the wickets kept on sliding at the other end with little resistance. The middle order batting collapsed and India was reeling at 118 and their four top order batsmen were sent back to the pavilion in 27.4 overs. 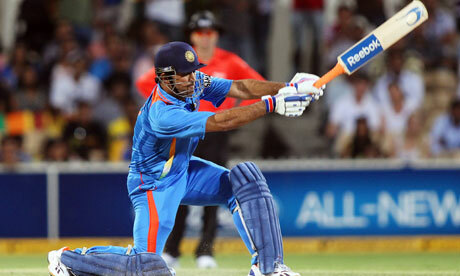 MS Dhoni came in next and consolidated the innings with Gambhir who had completed his fifty in the process. Dhoni got a life when he survived a caught and bowled chance by Thisara Perera for 10 on the first ball of the 31st over which was a costly let off. Dhoni got full use of the chance and escalated the scoring and supported well to his partner. The duo added 60 runs for the fifth wicket when gambhir was unlucky in the successive match to lose his wicket in the nineties. He was run out for 91 runs and once again the burden hanged on the shoulders of Dhoni. He faced the same situation in the fourth match of the series against Australia on February 12, 2012, when he took his side to four wickets triumph. India required 59 runs to win the match in 9.3 overs with five wickets in hand. The wickets crumbled at the other end and the sloppy fielding of the Islanders continued. Sangakkara dropped a skier from Dhoni on the second ball of the 48th over when he had scored 44 runs. India was searching nine runs in the last over and Sri Lanka required two wickets to win the thrilling encounter at the end of the 49th over. The last over was bowled by Lasith Malinga and the Blue Shirts were four runs short after five balls. Dhoni scooped the last ball over extra cover, got three runs and the match was tied. Malinga and Thisara Perera chipped in with two wickets each as Kulasekara held one while four batsmen were run out. Two points were shared by the both teams as the match came to an exciting end.